Updated: LG sent out a press release later Tuesday that solidified the phone's specs, including the 1.7GHz Snapdragon S4 Pro quad-core processor, 3140mAh batter, 2GB of memory, and 13MP/2MP rear/front cameras. What we also learned from the release is that the phone's glass is "curled [and] curved," creating what LG is calling a "2.5D" effect, something we'll look forward to checking out if LG decides to pack it along for MWC. The plus-sized Optimus G Pro is set to launch in February, when it looks to be available in both black and white. The recently announced Optimus G Pro was already slated to drop in Japan in April, though LG hadn't yet announced a date for its native country of South Korea. A slightly revamped Optimus G, the Japan-bound Pro featured a 5-inch 1080p IPS display, 1.7GHz quad-core Snapdragon processor, and would run Android 4.1: Jelly Bean. While the Japanese version of the smartphone sounds rather enticing, rumors sprung up late last week that LG was planning yet another Optimus G Pro for South Korea. 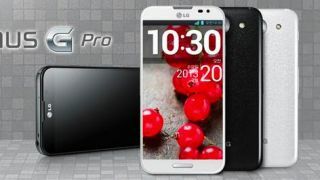 On Tuesday, some of those rumors were confirmed, when LG announced an even bigger, better Optimus G Pro for its homeland. Maybe it's playing favorites? According to the LG Facebook page, the South Korean edition of the Optimus G Pro will feature a 5.5-inch HD IPS-LCD 1080p screen, putting it in direct competition with the Galaxy Note 2. The manufacturer also stated more details and specifics about the new smartphone would be revealed as more and more people "liked" the company Facebook page. Whether or not those details will confirm the reported 1.7GHz quad-core Snapdragon processor, 2GB of memory, and 13MP/2MP rear/front cameras remains to be seen - if you're curious, a page like might help. The South Korean version is also believed to tout a 3140 mAh battery, a boost over the Japanese version. There's a chance the Optimus G Pro could find its way outside of the two announced markets, and into hands in Europe and North America, but we'll likely have to wait until the Mobile World Congress to find out LG's future plans.